by Louis B Davis (1860-1941). top right by Davis, “I am sending this as a guide for tone in painting……L.D.”; c1928. h: 6ft, w: 28” inc frame. Laurence in Ludlow, Shropshire (see third image). Davis completed two sets of windows for this church. amongst others. 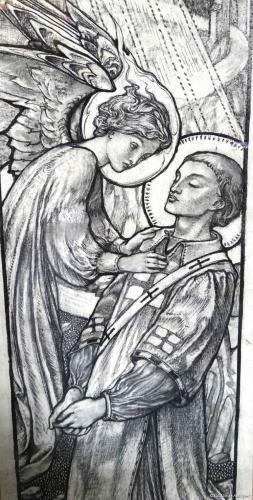 Sir Nikolaus Pevsner described him as the last of the Pre-Raphaelites.